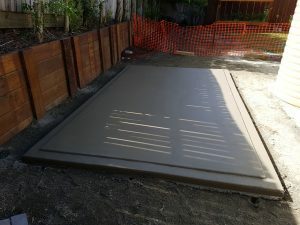 As well as selling garden sheds, Suncoast Garden Sheds also runs a concreting business. Which caters for the small concrete supply market and provides their customers with an economical alternative to previous supply options. The whole process of buying a garden shed is now made even easier being able to do it all at the same place! Please see estimates below – Final price is subject to site assessment, prices given are based on easy access and level ground. All our shed slabs are rebated meaning that the shed floor is raised inside the shed to ensure weather proofing and minimizing water ingress under base rail (As per photo below).